For an email-marketing program to be successful, the message must be delivered. In this article, I’ll explain email deliverability basics, and offer four tips to make sure your emails hit the inbox of your recipients. An IP address is a numerical number for the servers (i.e., computers) your email comes from. IP addresses are, in essence, your credit score for sending email. They track the reputation of a sender. If an email has been flagged for suspicious, spam-like activity, it’s the IP address that identifies the sender. Find out if you have a shared or unique IP address. Your email service provider — the company that sends your emails and stores your database — will assign an IP address to you when you first sign up. A shared IP means you use the same address as other customers of the ESP. A unique, or dedicated, IP is assigned only to you, and not other customers. Unique IP addresses typically cost more money. If you have a unique IP, start slow and prove to the email providers — i.e., companies that offer email services to consumers, such as Gmail, Yahoo!, Hotmail, Comcast, many others — that you are a legitimate sender. Email providers typically do not allow large quantities of email to go through without a history or established reputation. A shared IP address could cause issues as your reputation is shared with other customers of your email service provider. If those other customers send suspicious email, or spam, it will impact you. If you send suspicious email, it will impact those other customers. Keep your IP address handy. Make sure to check it often, just as you would our own credit score. There are dozens of blacklists that list IP addresses and domain names that have suspicious mailing activity, such as sending emails to “spam traps,” which are an email addresses that were once real, and have either gone dormant or changed. If you frequently send to old email addresses that have not responded in a while, you risk hitting a spam trap and falling onto a blacklist. This situation happens often even to the most trusted senders. Do research. If you have found your IP address or domain name on a blacklist, most have a simple form to fill out that allow you to contest the listing. It will typically be taken off immediately or within 24 hours. Blacklists are designed to help keep legitimate spam away from the general public. But often, legitimate senders find themselves on a blacklist. Be diligent in monitoring your IP addresses. Request to be removed from any lists you think are an error. You should have no issues removing yourself from blacklists. 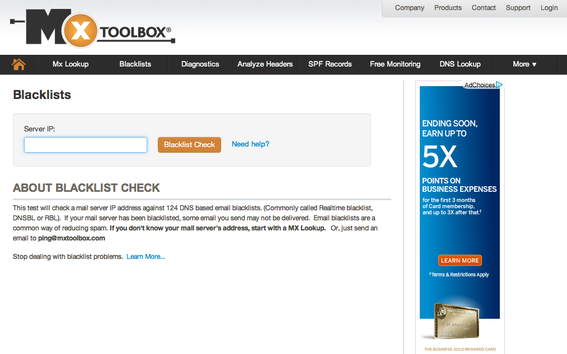 Two sites that can help monitor your IP address are MXToolBox and DNSBL. MXToolBox can help you determine if your IP address is on a blacklist. Every email database has different email domains. Most email service providers have a tool that allows you to either query by domain, or will give you a percentage breakdown of what domains make up your file. If your customers are primarily businesses, typically no one domain will take up a large portion of your file, since business emails are the domain of the company an individual works at — they tend to be diversified. However, for basic consumer sites, your database will be a mix of the more common email providers, such as Yahoo!, Gmail, Hotmail, and AOL. These providers will typically represent the majority of any consumer database. Be sure to monitor your database performance by domain. Analyze your delivered rates, opens, and clicks by domain. This will quickly identify if you are having issues with any of the major consumer email providers. For example, if your average open rate is 10 percent, and you see all Yahoo! emails — i.e., yourname@yahoo.com — are only opening at 3 percent, it may be that your emails are not getting fully delivered at Yahoo!, or are being marked as “bulk” or “spam” for that provider. You can easily segment your file and monitor each email provider separately. These providers are continually changing rules and algorithms. What may get flagged as bulk with one provider may not necessarily be an issue with another. Determine the top four providers in your database. If it’s a consumer database, these will likely be Gmail, Yahoo!, Hotmail, and, perhaps, AOL or Comcast. Stay on top of what the main four providers are changing in terms of email deliverability, and make sure your sending practices conform accordingly. Email providers have become much more sophisticated in what they filter as a bulk, or spam, email. Years ago, using basic subject line and text screening of certain trigger words like “Free” was a detection tool for spam. Today, providers look more at a recipient’s behavior and interaction with a certain mailer for determining if an email is a bulk message. Although recipients may have subscribed to a website’s email program, if the recipients do not open or click any of their emails over a period of time, the emails may go directly into the spam or bulk folder. This reflects the sophisticated algorithms some mail providers use to filter the mail they think recipients are not interested in receiving. As marketers, it becomes challenging to keep recipients engaged, to prevent the emails from going into bulk folders. Email marketing programs are vital to most ecommerce sites. An email message is only as effective as its ability to be delivered into a recipient’s inbox. Thus, monitoring the delivery of your emails is key to the overall success of your email-marketing program.